Tuesday, they trailed 3-0. Wednesday, they trailed 2-0. Thursday, they trailed 4-0. 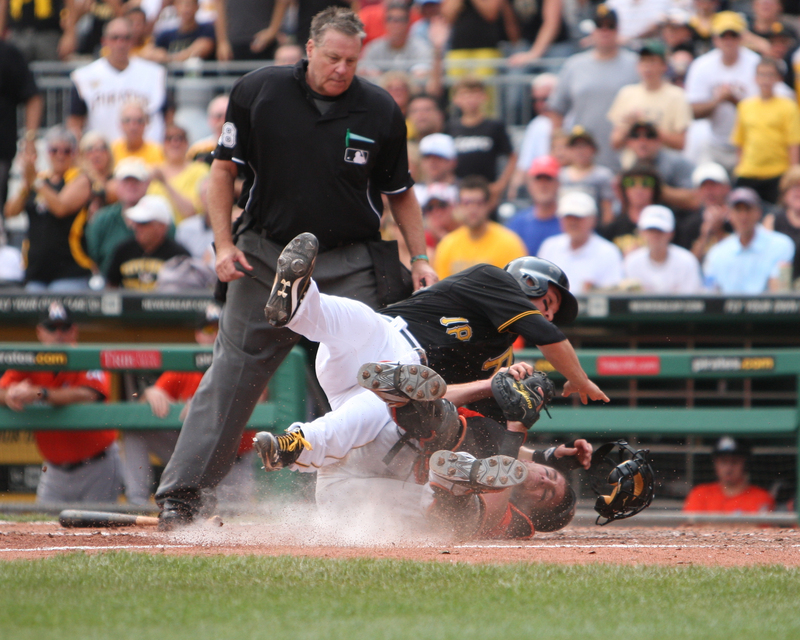 No problem, no problem and no problem for baseball’s best team, the Pittsburgh Pirates. The Miami Marlins grabbed the series’ largest lead in the finale, but the Pirates used timely hitting and five shutout relief innings to complete their 28th comeback win and a PNC Park-record 9th walkoff victory. Thursday afternoon’s pinch-hit hero was Russell Martin, who grabbed Pittsburgh’s 70th win by bouncing the game-winning single down the third-base line. Thing is, Martin had to ask the media if it happened in the 9th or the 10th. “I played for a minute,” Martin joked. It was the 10th, Russell, and your walk-off put the Pirates 9-5 on the season in extra innings. How do the Pirates keep doing it? How is this team an NL-best 24-15 in one-run games and now an impressive 24-27 when their opponent scores first? Part of their comeback style are the intangibles: luck and heart. “We’re long on guts and we’re gonna play to the end,” manager Clint Hurdle said. A bigger part of their comeback style is the excellence of the bullpen. Pirates’ relievers are 2nd in the National League (behind the Braves) with a 2.86 ERA and 1.13 WHIP. Wednesday was their NL-most 16th win when trailing after five innings. The “Shark Tank” bullpen kept Pittsburgh in the game after starter Gerrit Cole (5 IP, 6 H, 4 ER, 1 BB, 4 K) put the Pirates down 4-0 by serving up Christian Yelich’s first MLB home run, a two-run shot. 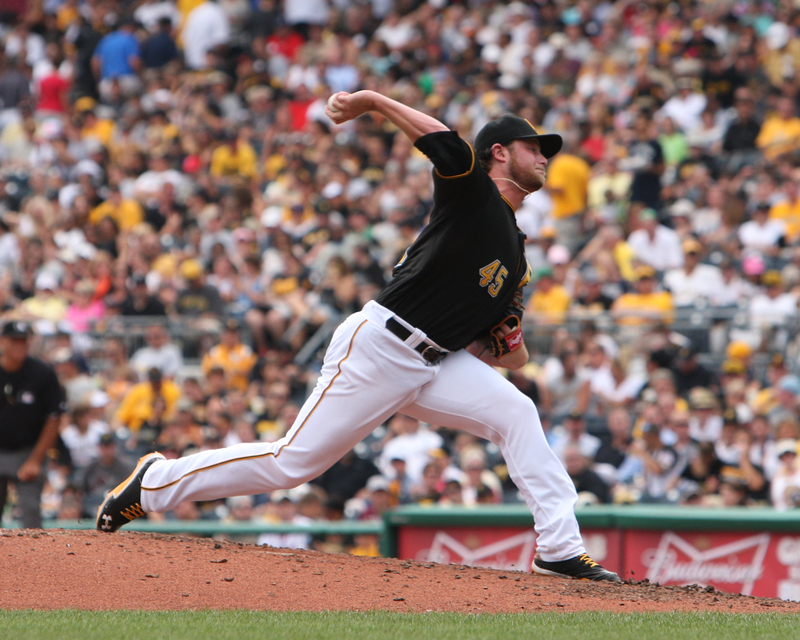 Pirates relievers pitched 10.1 shutout innings in the home sweep of Miami. Marlins starter Jose Fernandez (5 IP, 5 H, 2 ER, 4 BB, 5 K) out-dueled Cole for the rookies’ second matchup in as many weeks. He struck out five of his first nine Pittsburgh batters, looking just as un-hittable as in his 13-strikeout performance against the Pirates 11 days prior. 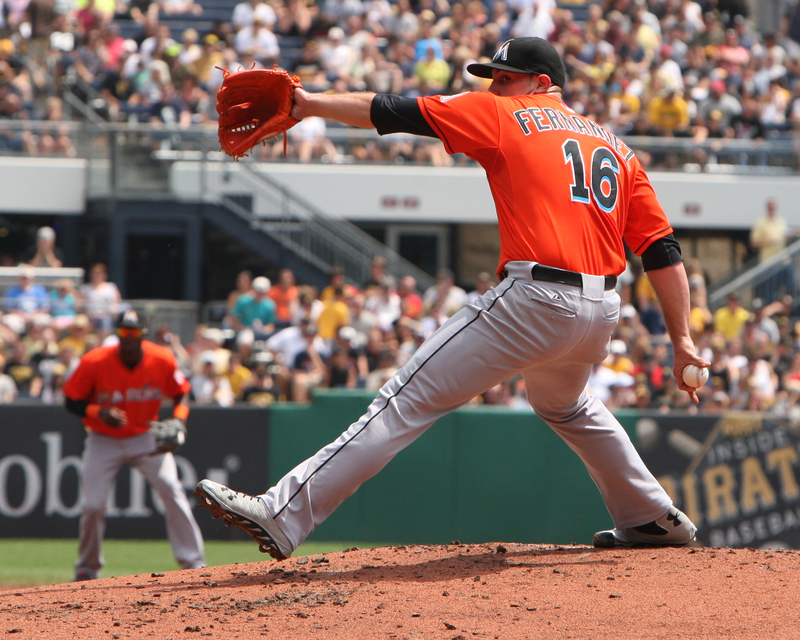 That was the only problem for Fernandez: efficiency. He threw 46 pitches to get through the Pirates lineup just once, and needed four pitches or more to get through 14 of his first 15 hitters. 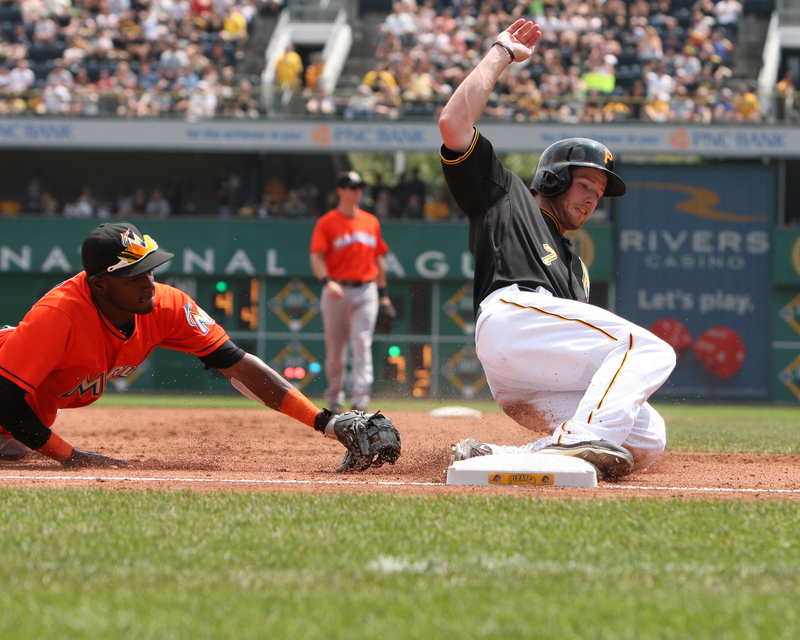 The top of the Pirates’ lineup finally knocked the Marlins starter out in the 5th. With Miami leading 4-0, Fernandez walked free-swinging leadoff hitter Starling Marte for the pitcher’s 4th BB, then Alex Presley grounded a single just under the glove of shortstop Adeiny Hechavarria. Walker followed by popping up to the left side, but the ball dropped into the grass to score Marte. Next batter Pedro Alvarez lined Fernandez’s 96th pitch to right field to score Presley, but Giancarlo Stanton rocketed his throw to catch Walker at home plate. Fernandez was done at 101 pitches, though, as was the damage that cut Miami’s lead to 4-2. In the 7th, the top of the Pirates lineup struck again. After Jose Tabata drew a leadoff walk from Chad Qualls, Starling Marte and pinch-hitter Andrew McCutchen hit back-to-back singles to load the bases and chase Qualls. Left-hander Mike Dunn entered to get Neil Walker as a right-handed hitter, but Walker fought for a sacrifice fly (“Good enough,” he said) and his second RBI of the afternoon. Alvarez worked a seven-pitch walk to load the bases again, and righty pinch-hitter Gaby Sanchez came in to spell the end for Dunn. INJURY UPDATE: McCutchen was a late scratch from the lineup with right shoulder discomfort, agreeing with the manager before the game that he would only hit and not throw or field. Hurdle called it “preventative maintenance.” McCutchen said their was not an incident that caused the discomfort, that “it just got sore over time” and he will “be ready to go” Friday. Gaby Sanchez roped Ryan Webb’s first pitch to right-center, but Stanton chased it down to make it a game-tying sacrifice fly instead of a go-ahead double. Though Tony Sanchez reached on Hechavarria’s throwing error (Alvarez hustled to second, beating his throw), Josh Harrison grounded out on the first pitch he saw. 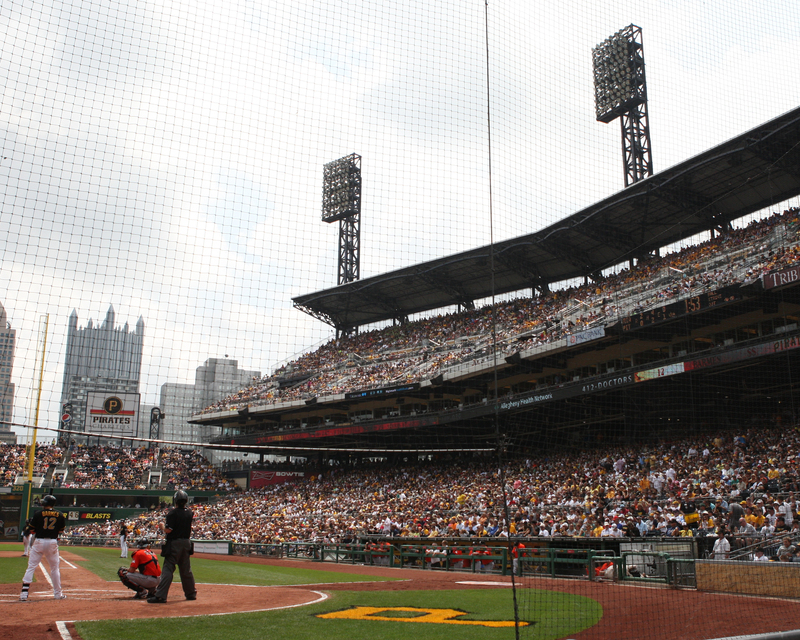 The 33,646 fans cheered despite Harrison leaving the bases loaded, as their Pirates had tied the game 4-4. Jeanmar Gomez pitched two scoreless innings, and Justin Wilson added a much more heart-stopping scoreless 8th. The young left-hander struck out slugger Giancarlo Stanton (who opened the game with an RBI double) on a 99-mph fastball and got cleanup hitter Logan Morrison to fly out. Then Wilson walked Placido Polanco, gave up a single to Hechavarria and walked Justin Ruggiano on four pitches to load the bases. That drew a visit from pitching coach Ray Searage and catcher Tony Sanchez to reset him. “[Wilson was] just a tad quick with his front side, which kind of made his release point not as far out in front as where he wants it, getting out over the ball,” Sanchez said. “He made his adjustment and got the next guy out” by getting Jeff Mathis to fly out. Mark Melancon pitched a 1-2-3 Top 9th by using his signature cutter to strike out Yelich (who entered the at-bat 3-for-3) and Ed Lucas. Though Alvarez and Tony Sanchez missed their chances to walk off in the Bottom 9th with a runner on base, Jared Hughes went 1-2-3 in the 10th inning and handed another opportunity to the offense. Harrison hit a leadoff single to right off pitcher Steve Ames, then Clint Barmes bunted him to second. After Tabata grounded out and Starling Marte was intentionally walked, Hurdle used his last position player Russell Martin to pinch-hit with two outs. The Bucs’ 12th hit of the game ended it. Sweeping the Marlins caps a 9-2 homestand and puts the Pirates at a season-best 26 games over .500. They lead the NL Central by 3.5 games and have reached 70 wins quicker than any Pittsburgh team since 1972. Once again, you can send your kudos to the bullpen for three consecutive comeback wins during Shark Week. Interesting that Tim wrote an article that the Pirates could be a 100-win team in 2015. 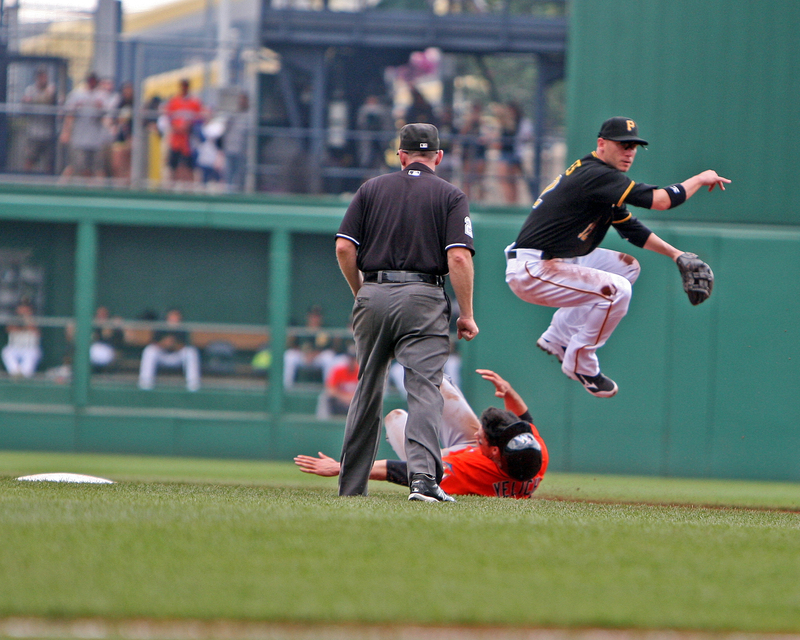 The 2013 Pirates are on pace to win 99.5 games. I don’t expect them to keep up this pace, especially going on the road, but I won’t be shocked if they do. Everything is working and Neil Walker is finally hitting. Henderson Alvarez might be the next best. That guy has been untouchable 12 of 13 innings against us. If Cole can develop half as good of breaking pitches as Fernandez has he will be very tough, Fernandez is the best young pitcher I’ve seen in the league this year by far. I think Fernandez is really special, but to say he is “by far” better than Harvey of the Mets, or Miller of the Cardinals, is not factually accurate. Unless of course you haven’t seen those two pitch. For those, like me, suffering from collapse anxiety here is some good news. After starting 63-47 last season the Pirates finished 16-36, including 1-3 in games 111-114. This year after a 66-44 start the Pirates are 4-0 in games 111-114. I would like to see Tony hit a little better, but he is looking good behind the dish so far.